For years I avoided installing keyboard shortcut tools on my computers. I thought dog-gonnit, if something needed to be typed out, I'd type every letter myself. Recently I capitulated, however, and I must say, going back seems unlikely. If you've never tried a text-replacement app, I highly recommend doing so. The time it saves is incredible, and after I abandoned my grouchy old ways, I've grown to love it. 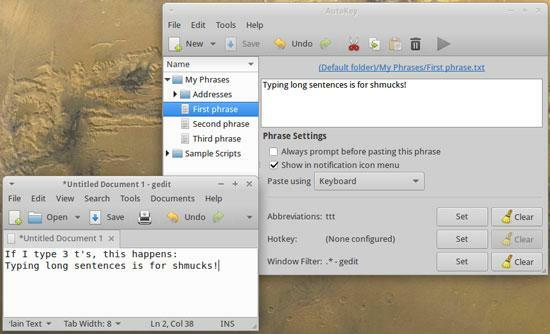 Unfortunately, there aren't too many options in Linux for really good text-replacement apps. My personal favorite is Autokey. It can be a challenge to set up, but that's mainly because it's so powerful. If you want text replacement to work only in a particular app (think programming code shortcuts), it can be set to work only with those apps. If you want to have a special hotkey required before text replacement works, that's an option too. In the screenshot here, you can see I make a simple auto-replacement shortcut so that every time I type "ttt", it replaces it with a sentence. It works only in gedit, because that's the constraint I set in the settings. Even though it has a very complicated interface, the Autokey program is a great program, and one we hope continues to get updated once it no longer works. It's currently available for Ubuntu 12.04 and below, but it will install on recent versions without a problem. Autokey takes this month's Editors' Choice award, because once you start using it, you won't be able to imagine life without it! Get your copy today at https://code.google.com/p/autokey.